When searching for the best weighted blankets for your kids, you’ll want to put safety as a priority. Of course, you’ll also want the blanket to be effective in helping your child’s struggle with sleep. Weighted blankets are not new inventions. Instead, weighted blankets have been used by therapists to help patients with anxiety, insomnia, and autism. Recent years has seen weighted blankets being propelled to the mainstream market, with several startups securing funds in Kickstarters to make commercial weighted blankets for both adults and kids. A weighted blanket is basically an overweight version of your typical blanket. It is usually filled with non-toxic poly-pellets or glass beads to deliver a distributed weight over a person’s body. This creates a rather similar sensation of a hug, or deep pressure touch, that increase the level of serotonin and melatonin in the brain. As a result, you’ll feel relaxed and calm as these feel-good hormones increased. Besides being trusted by therapists, studies have also been conducted on weighted blankets and one such studies have points to reduced anxiety amongst patients. Another study also concludes that weighted blanket helps participants in getting longer and deeper sleep. With various benefits associated with weighted blankets, parents have turned to weighted blankets to help their child to reduce bedtime anxiety. But are they actually safe for your young ones? This is an important question every parent should ask, as weighted blankets are constructed to be relatively heavier than normal blankets. Weighted blankets should never be used for toddlers below 2 years of age. A standard rule that ensures the effectiveness of weighted blanket is that they must be approximately 10% of your body weight plus 1-2 lb. Choosing the wrong size of weight of weighted blankets can pose safety risks to children. A 5 lb weighted blanket is commonly used for children above 2 years of age, where the typical body weight falls between 20lb -30lb. When it comes to safety, don’t take what you read from the manufacturers for granted. Instead, follow these guidelines to ensure that the safety of your child is not compromised at all time. Always ensure that your child has the ability to remove or put on the weighted blanket on themselves. Do not roll the weighted blanket on your child. It should cover your child leaving the neck and face unrestrained. Never use a weighted blanket meant for adults for your child. When choosing a weighted blanket for your little ones, you’ll want to do your homework diligently. Not only you’ll want to avoid a low-quality product, you’ll want to ensure that both the health and safety of your child are not compromised. Here are what you should look for when buying a weighted blanket. Size and Weight – Ensure that size of the weighted blanket is not overwhelmingly large for your child. The weight of the blanket should also fall within the appropriate range of your child’s body weight as indicated above. 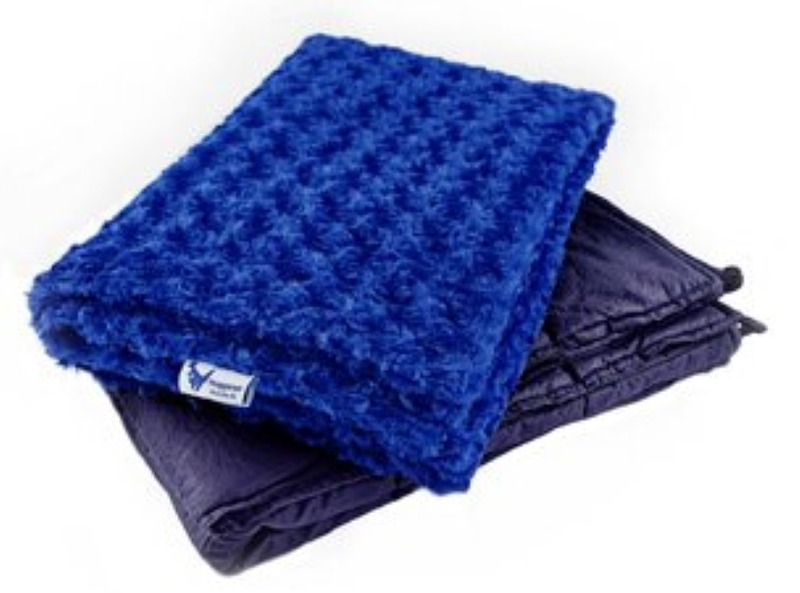 Hypoallergenic – The blanket must be made from the hypoallergenic and non-toxic material. Cleaning – Occasionally, you may want to clean the weighted blanket. Choose one that allows you to do so easily. 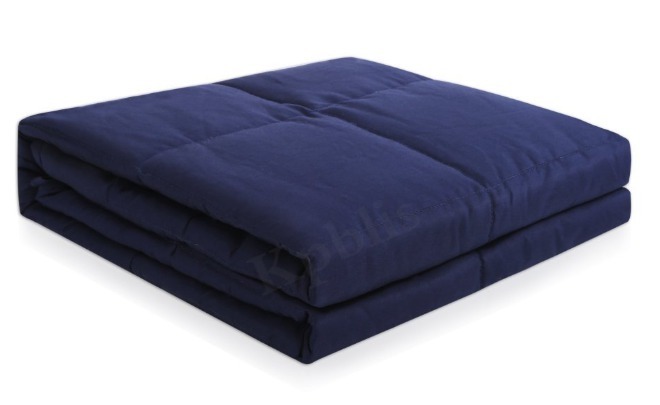 Some weighted blankets come with a duvet cover to protect the inner layer. Quality and credibility matters when it comes to buying weighted blankets for kids. I strongly recommend buying at Amazon as most of the reputable manufacturers are selling their blankets there. Besides, you’ll be able to check the reviews from other buyers before making a decision. Important: If your child is struggling with sleep or any other medical conditions, you’re advised to consult your doctor before using weighted blankets. This article is not written by a medical professional, health expert or a doctor. Thus, it is not a substitute for medical diagnosis or treatment. With hundreds of differently weighted blankets to choose from, you’ll probably we overwhelmed before making a decision. I’ve shortlisted some of the best weighted blankets for children and I hope you’ll find them helpful. Weighted blankets are generally expensive but this is one of the cheaper ones with reasonably good quality. It weighs 5lb and measures 36″ and 48″. It is built to optimize sleep and reduce anxiety for children weighing around 50lb. The design also incorporates safety as the weighted blanket is filled with non-toxic poly pellets. This ensures that not only your child enjoy better sleep, but also not exposed to any toxic and harmful materials. Cleaning the blanket is a simple process as the blanket can be separated from its inner weighted layer. The minky layer can be removed and washed when and as needed. If you need to wash the inner layer, make sure that only cold wash and air dry are used to preserve the lifespan of the blanket. Helps kids to sleep better. The weighted pellets may shift. 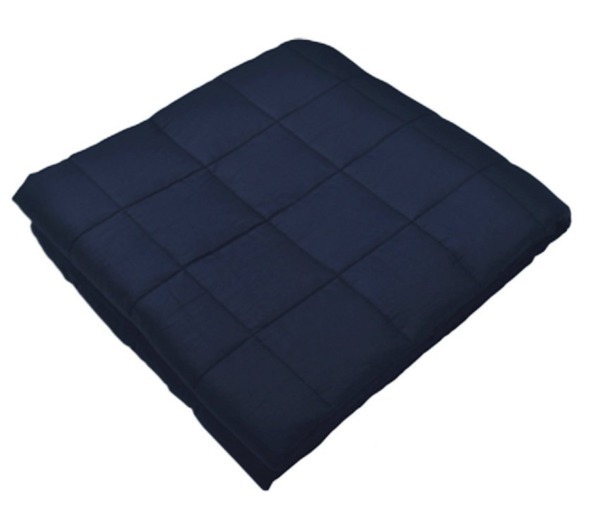 Unlike other weighted blankets that are filled in poly pellets, this blanket by YnM is made of high-quality breathable cotton with hypoallergenic glass beads sewn in pockets of the inner layer. This gives a smoother sensation and is reasonably quiet compared to plastic materials. The weighted blanket functions well to help reduce anxiety in children and promote better sleep. This is due to the effect of deep pressure touch, where the glass beads stimulate the release of feel-good hormones in the brain. The weighted blanket can be washed gently on a machine but it is advisable that you get separate duvet cover to ensure that the blanket lasts for a longer period. The blanket is 5lb in weight but there are other options from YnM if you required other weight options. 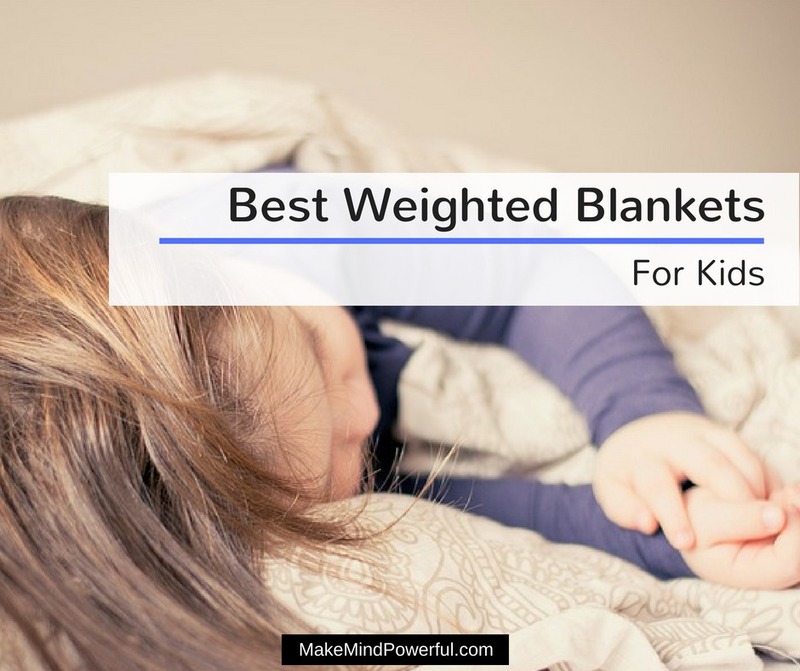 While a standard rule applies on matching the weight of the blanket to the body weight of a child, it is important that the child needs to be able to be able to move the weighted blanket when needed. With the right weight, you’ll find that your child sleeps beautifully as the therapeutic effect kicks in. Smooth and evenly distributed weight. Effective in helping anxious children to sleep. Glass beads leaking in some blankets. 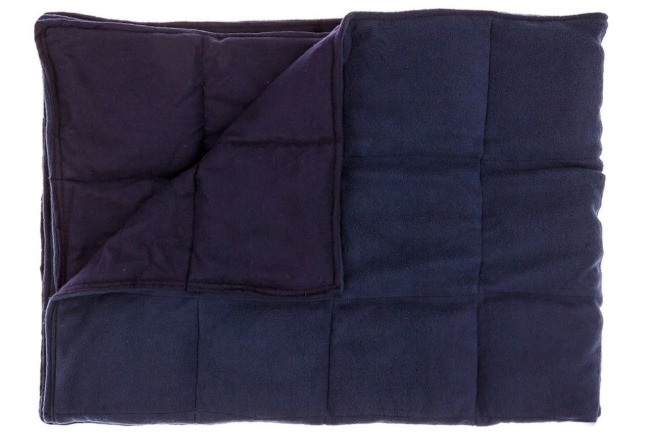 This weighted blanket by Huggaroo is ideal for children weighing between 30 to 80 lbs. It is consists of an outer cover and inner layer. The cover is made of 100% Chenille polyester while the inner layer is filled with non-toxic, hypoallergenic glass beads. Both the cover and inner layer are machine washable. However, it is recommended that the inner layer is not washed frequently to ensure it does not get damaged easily. Before you use the blanket, ensure that the double ties along the inner quilt is secured to ensure that the weight is regularly distributed throughout usages. The soothing hugging sensation from the weighted blanket will help your little ones to have better sleep. It helps the brain to release neurotransmitters that calms down the mind, just as when you’re hugging your child. You’ll find that the design features luxurious touches from both the selection of materials to the choice of colors unique to Huggaroo. When you purchase a piece of weighted blanket from Huggaroo, 1% of the profit is donated to One Simple Wish, a charitable cause that aims to improve the live quality of foster children. Great in helping children to sleep. Soothing hug sensation reduces anxiety. Sand may shift is the ties are not secured properly. 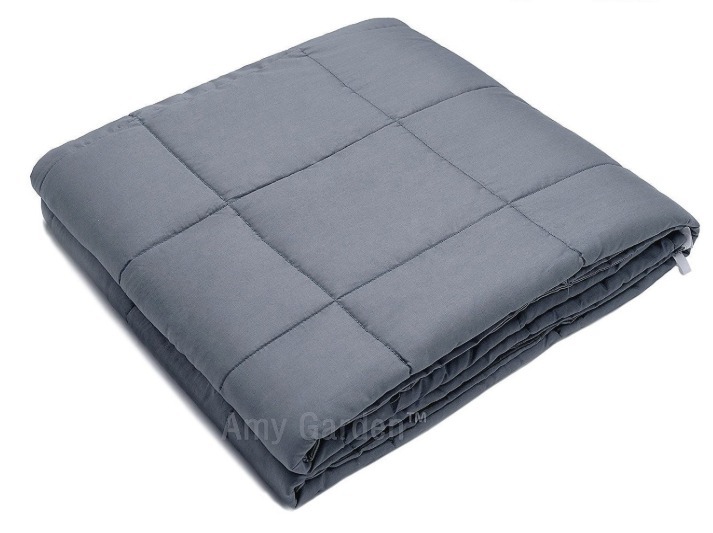 A weighted blanket like this from Amy Garden will help your child to feel secure as they struggle to fall asleep. The sensation of the odorless glass beads helps children’s brain to release hormones that create a soothing effect on their mind. The outer layer is made of breathable cotton which prevents too much heat from being trapped. It’s not unusual if you find the blanket to be slightly heavier than normal blankets for your child. The blankets by Amy Garden is meant to weigh between 10% -15% of the weight of your child. This 5lbs blanket will be great for children between 40 lbs to 50 lbs. You can wash the weighted blanket with a dry cleaner. Or you can purchase a separate duvet cover to keep the blanket from getting dirty easily. With proper care, the blankets will last long enough for the money spent. While the blanket helps your child to feel safe and secure, you should always remember that the weighted blanket should never cover their head or neck. Besides that, your child must also possess a reasonable strength to remove the weighted blanket. Filled with odorless, non-toxic glass beads. Helps in calming down anxious children. Pellet leaks in some blankets. Harkla is one of the leading brand in weighted blankets and you can expect this blanket to be exhibit superior quality. The duvet cover is extremely soft and remains so even after being washed. It has dotted fabric that helps sensory processing. The inner layers are filled with both hypoallergenic glass beads and cotton to ensure that the weight is distributed more evenly. The duvet cover can be easily removed to be cleaned when it gets dirty. You can also wash the inner layer if it is necessary. This 7 lbs blanket fits beautifully for children weighing 40 lbs to 70 lbs. It helps to put an end to the endless struggle your child goes through every night as their hyperactive brain refuse to calm down. Both you and your child will enjoy better sleep and wake up feeling more refreshed. You can also buy this blanket as a gift to your nephew or niece as the modern look of the blanket doesn’t scream therapeutic. Besides being a gift of blissful sleep, 1% of the sales are channeled to the University of Washington Autism Clinic. Dotted fabric for children to fidget with. Helps to calm your child down. Beads shifted irregularly in some blankets. 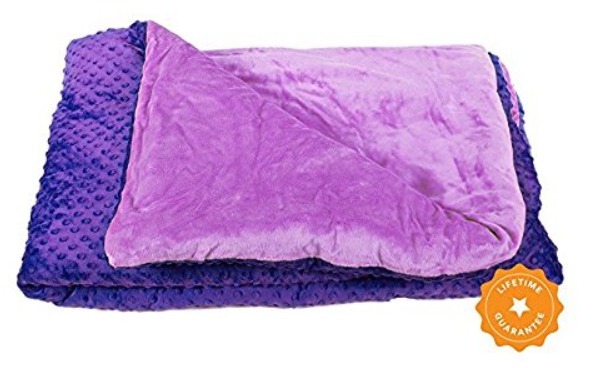 This weighted blanket is filled with hypoallergenic non-toxic poly pellets that are safe for kids. The pellets are well contained in square pouches that ensure the weight is evenly distributed throughout the blanket. The fabric is made of natural breathable cotton to prevent getting too stuffy. Designed to 10% of the body weight of a child between 30lbs – 70lbs, the weighted blanket helps your little ones to relax when they are feeling anxious. This enables them to fall asleep easily instead of a constant struggle during bedtime. The weighted blanket can be easily washed although on a gentle setting. If you do not want to risk damaging the blanket, you can purchase a matching duvet cover and fit it over the blanket. There are loops at each corner of the blanket that you can secure a duvet cover. Besides helping children to sleep, weighted blankets are also effective for autism and hyperactivity. Your child will feel the same calming effect from your hugs. Made with 100% natural breathable cotton. Defective blankets in some cases. 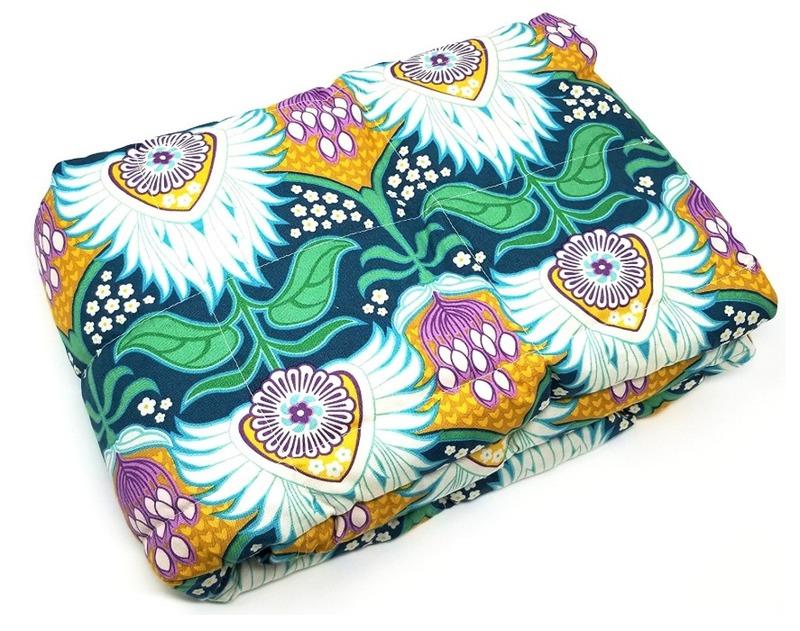 Weighted Idea is another popular brand of weighted blankets. The blankets are professionally designed to recreate the sensation of being hugged through deep touch pressure. This helps children to feel safe and secure and calms their little anxious mind down. Only the best materials are used in manufacturing the weighted blankets. The fabric is made of 100% natural breathable cotton that feels comfortable for children. Miniature sized non-toxic hypoallergenic pellets are sewn into smaller pouches to ensure that the weight is even across the blanket. The blanket does not include a duvet cover but it can be washed gently with hand. Alternatively, you can purchase a separate duvet cover. Your child will love both the hug-like sensation of the weighted blanket and the soft texture of the fabric. It’s a perfect natural remedy for children who struggle with bedtime. Helps children to feel safe and secure. Inner layer blanket can be hand-washed. Some blankets have pockets void of pellets. InYard’s weighted blanket is made in the US with 100% flannel and polyester forming the fabric and filled with hypoallergenic poly-pellets. The blanket provides deep pressure touch to increase the level of serotonin and melatonin in the body. This helps children to feel calm especially during bedtime. When using the weighted blanket, children tend to fall asleep easier and wake up fresher in the morning. Besides bedtime, you can also use the blanket to help your child relax after school or any stressful event. It is important to get the right weighted blanket according to the weight of your child. This 7 lbs blanket suits children between 40 lbs to 70 lbs. It helps to replicate the sense of touch and pressure that is similar to an assuring body hug. While you can hand wash the blanket, it is recommended that you buy a separate duvet cover to prevent the blanket from getting worn off easily. What customers love about this blanket is the detailed workmanship that speaks loudly of the quality. Some felt the blanket is too warm. Weighted blankets need not be bland and monotonous. At least, not when Calming Covers is concerned. The weighted blankets by Calming Covers featured high-end designer fabrics from renowned designers like Michael Miller and Riley Blake. The bright colored design will appeal to children immediately. Besides the aesthetic appearance of the blankets, your child will benefit from the therapeutic effect of the weighted blanket that helps reduce their stress and anxiety. Sleep definitely comes easier for children with weighted blankets. The inner layer is filled with food grade plastic pellets. They are the same materials that are used to make milk bottles and are safe for kids. The outer layer is made of 100% cotton and can be washed easily. The are various designs that you can choose to suit your child’s liking. Filled with food grade pellets. Helps to reduce stress and anxiety in children. Some children may not like the smell of the pellets. 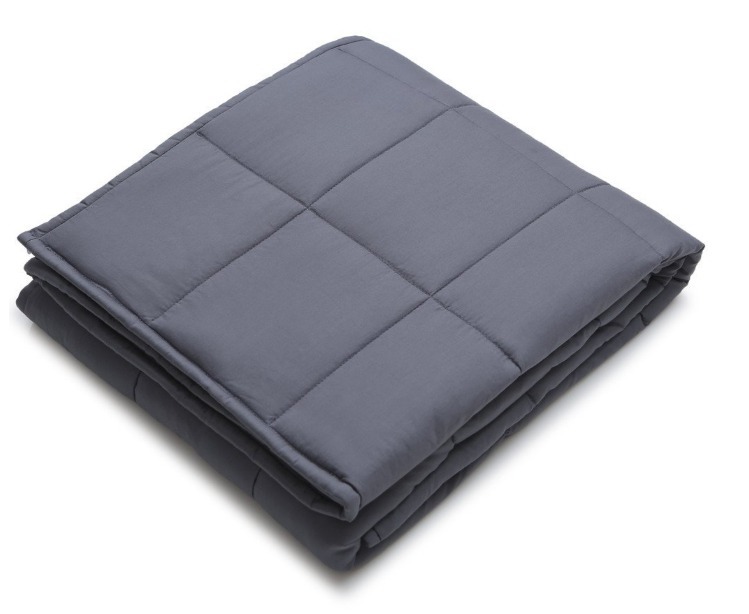 This weighted blanket is definitely not one of the cheapest around but definitely deserved a spot on this list due to its stylish design and premium material. Besides, it comes with both weighted layer and duvet cover, saving you precious time hunting for the latter. The duvet cover is built with security ties and a flexible zipper. The blanket is filled with tiny beads that are woven carefully to provide an evenly distributed weight. This made washing the blanket easy as you can remove the duvet cover and wash in machines. Your child will benefit from the stimulation from the tiny points of weight that increase the level of serotonin in their brain. This helps to calm their mind down and allow them to enjoy a good night of sleep. The beautiful design of the weighted blanket also makes it ideal as a holiday gift. Effective in calming restless children. Some blankets are missing the loops that separate the pellets. I hope that some of these weighted blankets solve the bedtime struggle for your kids. Let me know if I’ve missed out a great blanket that works wonderfully for you.